Brian Wilson, 1966, the fragile reason why The Beach Boys matter. Brian fought hard against the industry attitude that if it works, run it into the ground. Music meant much more to him than that. He was trying to do something so much bigger with his teenage symphonies to God. In the process, he really rocked the boat and changed the world. And that, my friends, as Lindsey Buckingham so eloquently described it, is exactly why The Beach Boys matter, and why I’m delighted to find a valid excuse, in the form of Tom Smucker’s concise new book on their cultural role (Why The Beach Boys Matter, from University of Texas Press), to wax rhapsodic on their true stature as serious artists concealed under the shiny veneer of pop music transience. Let me be even more blunt right upfront: The Beach Boys matter because of their founder and resident singer-songwriting genius Brian Wilson, and Brian Wilson matters because he is Brian Wilson, and he has also survived being Brian Wilson. Smucker makes it clear that of all the white American pop-music groups that hit the charts before the Beatles, only The Beach Boys continued to thrive throughout the British Invasion to survive into the 1970s and beyond. 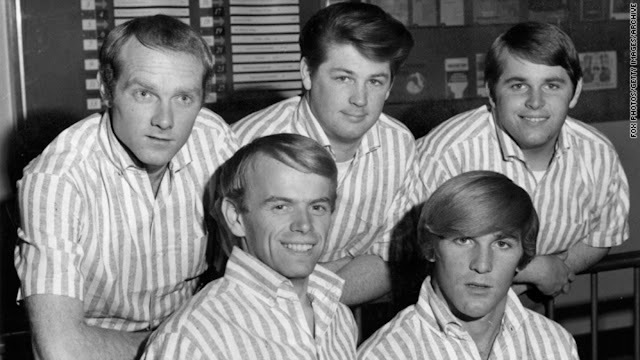 The Beach Boys helped define both sides of the era we broadly call the sixties, split between their early surf, car, and summer pop and their later hippie, counterculture, and ambitious rock. No other group can claim The Ronettes and The Four Seasons as early 1960s rivals; The Mamas and the Papas and Crosby, Stills and Nash as later 1960s rivals; and The Beatles and The Temptations as decade-spanning counterparts. This is the first book to take an honest look at the themes running through The Beach Boys’ art and career as a whole and to examine where they sit inside our culture and politics – and why they still grab our attention. Indeed, Smucker’s endearing little book (comfortably shorter and more accessible than most comprehensive surveys) make an important contribution to understanding the how and why of this West Coast pop band, either for first-time listeners (are there really any of those?) who want to grasp their essence and influences, or for seasoned veterans and fanatics who just like being reminded about one of their pet obsessions (that latter category would include someone like me). Smucker, who has written extensively on pop music for publications such as Creem and The Village Voice, knows whereof he speaks when he offers his personal reflections on this pivotal moment in history and on an amazingly prolific and technically perfect band. George Martin, The Beatles’ brilliant producer, remarked in 1996 that if there were one person that he had to select as a living genius in pop music, he would choose Brian Wilson. But Wilson, responding with characteristic embarrassment that same year, said that he wasn’t a genius, just a hard-working guy. Strangely enough, both of these apparently contradictory statements are true. One of the few singer-songwriters to ever challenge the sonic supremacy of The Beatles, Wilson, with The Beach Boys, singlehandedly did what John Lennon required the help of Paul McCartney and producer George Martin (himself a living genius) to accomplish: the creation of stylistically revolutionary soundscapes that served to fuel the dreams of an entire generation of flower children. Wilson was a genuinely gentle youthful spirit whose falsetto dreams of happiness echoed a generational urge – and he used his own insecurities and fears as the raw material for some of the most emotionally direct and romantically dizzying songs of our age. But then soon, just like The Beatles, he began to outgrow the corporate ‘‘brand’’ he had created with his brothers and cousin, the almost universal reviled pathological egomaniac Mike Love, and The Beach Boys began to undergo the kind of dark warping that stunts creative growth in favor of placating the marketplace. He had personally started to explore a new musical terrain that his own group was neither musically equipped to handle nor temperamentally interested in traveling towards. If Dylan is our T. S. Eliot and Ezra Pound rolled into one sneeringly hip container, then Brian Wilson is the Carl Sandburg and Robert Frost of popular music – deceptively simple, colloquial in phrasing, with a spare and evocative lyrical style embedded in the culture that created it. He celebrates his country and its potential at the same time he celebrates the desire of every youth to be free, happy, and, hopefully, in love. Never has love been evoked aesthetically, melodically and lyrically with a sonic texture so genuinely ecstatic as in Wilson. And in Tom Smucker’s reverential but reasonable text, we are treated to an expertly guided tour of precisely the reasons why so many of his songs can still bring a tear to our eyes, and why a personage of no less the stature of Leonard Bernstein once counted him among America’s finest composers. Smucker’s guided tour is a breathtaking one: “The Beach Boys' battered but resilient history travels through the entire time frame of baby boomer dominance, from 1961’s “Surfer Girl,” through the decades long delayed release of Smile (scrapped in 1966 but reborn in 2004), to 2014’s Love and Mercy biopic, on to Brian Wilson’s excellent 2015 solo CD No Pier Pressure. Never the story of a generation, The Beach Boys’ saga survives as one of a few that remain at a generation’s core.” And he is an excellent guide, knowledgeable yet affable, worshipful yet realistic and down to earth about the family values embedded in the group: three brothers and a cousin from the lower-middle-class suburbs of Los Angeles who made it way beyond big. As rock music got harder and harder, The Beach Boys got softer and softer (although also deeper), and Smucker does a good job of disabusing readers/listeners of the fallacy that Wilson’s band was trying to out-hip The Beatles (though he was definitely engaged in a friendly competition when it came to technical recording virtuosity). I hear the music as an honest reflection of the bewilderment, opportunity and dangers inside the struggle to stay relevant as the group’s audience and culture changed, and as the negotiated the burden and the blessing of their pre-Beatles heft. Then I hear that innocence disoriented and exhausted, even curdled into willful ignorance in the 80’s, and slowly rehabilitated, now mixed with regret, when Brian broke free in the 90’s and began touring again. It’s a career that over the decades sometimes sounded exhausted, or no longer significant, and then surprised with new bursts of creativity and cultural relevance. The author explores their early harmony and discord, with a maniacal abusive father who was a kind of white version of The Jackson Five’s father, with similar raucous successes and disastrous results; the early cars and guitar culture of teenage wastelands before they became fully wasted; the curious amalgam of suburbs and surf sensibilities (with Brian famously never even going near the beach he so blissfully extolled and only brother Dennis being anything like an actual beach boy); their incredible vocal skills magically manipulated through the arranging brilliance of Brian; the studio alchemy he was able to evolve so radically after being influenced as a youngster by the great but insane Phil Spector’s wall of sound and then influenced by a certain spiritual vitamin supplement (popularly known as LSD); their frenzied touring in a Yankee version of Brit-mania that freaked out Brian so much he couldn’t appear live on stage or even in public for literally years at a time; the band’s odd penchant for gurus and psychiatrists, most infamously manifested by cousin Mike Love (so inappropriately named) embrace of the Marahishi and Brian’s surrender to a father figure shrink Eugene Landy (who seemed to be a one-follower cult leader). Along the way, and for me the most precious creative space he explores, there’s Brian’s profoundly honest innocence in the making of what Smucker (quite rightly, I think) calls the second-best pop record in history, Pet Sounds in 1966 (the first being Rubber Soul in 1965) which inspired John and Paul to make Revolver, which in turn inspired Brian to make (or try to) his doomed masterpiece Smile. But before he could complete it, his family and band rebelled against his mesmerizing new stylistic direction . . . and then the coup de grace, the Beatles dropping a little item called Sgt. Pepper on top of his already shaky ego. Historians and critics alike are still trying to figure out how the young Wilson could have conceived all the glistening portions of Pet Sounds in his head at once, and then proceeded to manufacture the most crystalline sounds ever heard on record using only a Scully four-track tape deck. And oh yes, there was that genius thing again. And sonic students are also still trying to digest and understand even the slightest glimmer of meaning behind his astonishing attempted follow up, the forty-year-long saga of his gorgeously mystifying Smile. This is, of course, the holy grail of Wilsonia, what Smucker calls “the best unreleased pop album ever.” If you haven’t heard it, or maybe have only heard of it, put on some headphones some days and take a little vacation into the mysteries of sheer musical magic. The author is also quite cognizant of the fact that no matter how gifted Brian was (considerably) he still needed the vocal company of his bandmates to execute his arrangements, and he gives the hugely talented Carl Wilson, angelic Dennis, and Bruce Johnston their due. From my perspective, the less said about Mike Hate the better all around. I’ll leave it to the reader to encounter the sheer Jurassic Park-scale expanse of his arrogance, conceit and self-indulgence. After chronicling this metaphysical journey, he declares how long he’ll keep on keeping on, repeating it ten times just in case the listener missed the point. Alas, such a mournful and melancholy song, but at least there is one more thing that Wilson will be until he dies: one of our greatest and most inspiring singer-songwriters, elevated to Olympian status by every serious musician since. Admired by the rest of us for his fierce devotion to the muse that fuels him. Loved by all for his living example as a creative human being who survives his own demons daily. And by surviving, he demonstrates to us that survival is possible, and maybe even probable, with enough poetry. That, in the end, is what we most want our poets to do. They tell us dreams that keep us from falling asleep in the darkness alone. 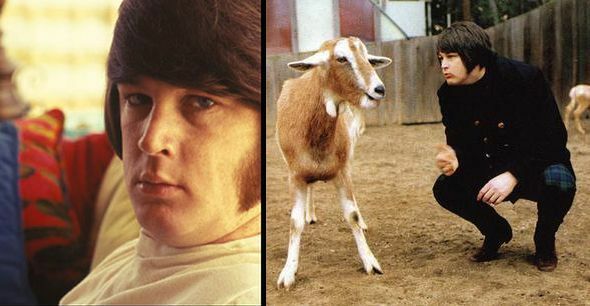 Brian Wilson is a dream teller extraordinaire. 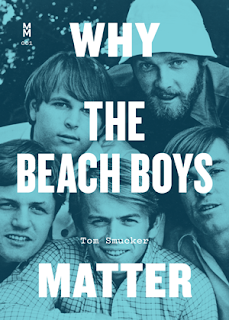 Smucker’s book on Why The Beach Boys Matter tells us exactly that, and quite evocatively. He also ends quite suitably with a respectful glance into Wilson’s solo post-Beach Boys career and includes a crucial and complete discography of all the records from over a half century of pure pop listening pleasure. Even when Wilson’s American dream soured somewhat due to personal psychological challenges that often turned into a nightmare (see the Love and Mercy film for more on that) he managed to triumph over his own adversity. His abundance of raw spirit allowed him to carry on telling it as it might have been. Which is why it is so natural for us to go on listening. As long as there are dreams to listen to, there will be audiences ready to open their ears and hearts, and yes, even our wallets, to the wounded minstrel. To the kind of artist Anselm Kiefer once described as a story teller with a broken story. Though it is true, as this book ably chronicles, that life sometimes breaks some of us, it is equally true (as Hemingway astutely observed) that many of us are stronger in the broken places. – Donald Brackett is a Vancouver-based popular culture journalist and curator who writes about music, art and films. He has been the Executive Director of both the Professional Art Dealers Association of Canada and The Ontario Association of Art Galleries. He is the author of the book Back to Black: Amy Winehouse’s Only Masterpiece (Backbeat Books, 2016). 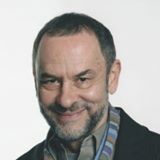 In addition to numerous essays, articles and radio broadcasts, he is also the author of two books on creative collaboration in pop music: Fleetwood Mac: 40 Years of Creative Chaos, 2007, and Dark Mirror: The Pathology of the Singer-Songwriter, 2008, and is a frequent curator of film programs for Pacific Cinematheque. His latest book was Long Slow Train: The Soul Music of Sharon Jones and The Dap-Kings, published in November 2018. He is currently trying to complete a book on the life and work of Yoko Ono.